The Facebook “like” icon displayed outside of Facebook’s headquarters in Menlo Park, Calif. Plenty of us saw the 2013 movie “Her” and wondered whether something like the customized personal assistant voiced by Scarlett Johansson could ever be possible. And then plenty of us moved on, never knowing whether we’d find the answer. Youyou Wu and Michal Kosinski decided to investigate. Wu, a social psychologist at the University of Cambridge’s Psychometrics Centre who has interned at Facebook, and Kosinski, a computer scientist at Stanford University, tried to create a precursor to Johansson’s character using a Facebook app called myPersonality. Is it possible, they wondered, that a computer program could be trained to understand and respond to a person’s thoughts and needs better than real people in his or her life? In a paper published online today in the Proceedings of the National Academy of Sciences, the researchers show that yes, computers can know us better than we know each other, at least as measured by a computerized personality test. Wu and her colleagues exploited a database of myPersonality’s 100-item questionnaires that measured users on a Five Factor Model of Personality, gathering data on how open, conscientious, extroverted, agreeable and neurotic people were. This wasn’t one of those sham personality tests, either — the app was created in 2007 by David Stillwell, deputy director of the Psychometrics Centre, and based on a scientifically validated model of personality. Users could also ask friends to assess their personalities using an abbreviated, 10-question version of the test, and the myPersonality database now contains more than 300,000 such friend-ratings. People who use the app can opt in to share their anonymized personality ratings and Facebook data for research purposes, and more than 40 percent of the app’s 7.5 million users have done so. 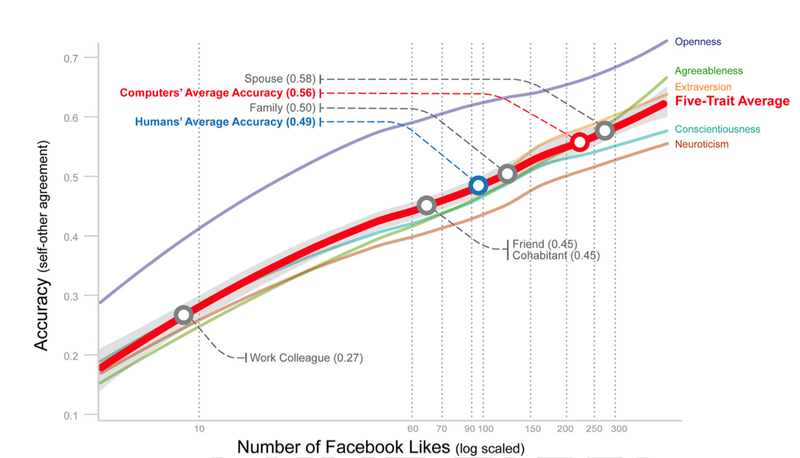 Wu and Kosinski developed an algorithm that predicts somebody’s Five Factor personality type using only Facebook likes. Using a sample of 17,622 U.S. participants who had been judged by at least one friend and a group of 14,410 users who’d had two friends fill out the 10-question survey, the researchers measured correlations between the self-judgments of personality and the judgments made by Facebook friends. The following chart shows a few of the associations between Facebook likes and personality traits that they found. The average Facebook user had liked about 227 items, but the computer program needed only 100 likes to outperform the average human judge. The model predicted the average person’s five-trait personality better than their work colleagues, Facebook friends, and even some of their family members. Only spouses outperformed the model, on average. Given enough likes, the computer can always outperform humans, Wu said. The ability to create an accurate personality profile depends on having enough relevant information to work with, and in some cases, the computer has more signals and can better access and assess them than the human mind can. “Even if I gave you a list of likes, you might not be able to remember them or make sense of all of them,” Wu said. Another advantage: Computers can generate algorithms to make predictions in a rational and consistent way, while people often fall prey to bias by giving undue weight to certain things. The study, of course, doesn’t prove that the “Her” scenario is possible. People are unlikely to fall in love with a computer program that merely predicts their five-trait personality profile, and it’s probably overreaching to sell this model as superior to human judgment just yet. Yes, the differences between the computer and the humans were significant in a statistical sense, but it’s also a very large sample size, and that means most differences will reach such significance, said Joshua Miller, a clinical psychologist who studies personality at the University of Georgia. This study’s bottom line is that a computer can outperform humans at predicting a score on a computer test, and that’s hardly surprising. In real life, the computer probably isn’t meaningfully superior to humans in ways that matter. Take it a step further and combine such aggregated information with artificial intelligence-enabled chat bots like Cleverbot or Jabberwacky, and it’s easy to envision us slipping into a world like the one depicted in an episode of the British TV show “Black Mirror,” where a grieving widow looks for comfort in a replica of her dead husband, created entirely from the traces of him left behind. Before you freak out, know that we’re still a long way from that. How far? You can try the personality predictor and decide for yourself.